We finally bit the bullet and purchased the cork flooring that I've wanted ever since I found out that our first floor does not have hard wood hiding under the carpeting. I spent a long time researching cork before deciding that the pros outweighed the cons. I got a lot of really good information from thissortaoldlife.com. If you are considering buying cork you definitely need to read this post. I like that cork is softer, warmer, and more comfortable to stand on than my other flooring choices. But mostly, I just love the way it looks. I decided on the type of cork flooring that I wanted, Wicanders Originals Accent. I found it in a store semi-near me and checked it out in person. I then waited a year, just for fun. Then I shopped around on the internet and found two sites that were competitive in price and contacted them both over the phone. I felt more comfortable with the first site I had visited, but their price was several hundred dollars more. When discussing my order with both sites I mentioned that I was shopping around and the site I liked better immediately lowered their price by several hundred dollars. To save on shipping I chose to unload the flooring from the truck myself. This morning when the truck pulled up I was prepared to jump in the back and start handing boxes down to Tim. Luckily the truck driver said he'd use his lift to lower the pallet to the street. This option was the $50 shipping upgrade I had said no to, and here we got it for free because the driver didn't want to wait around for us to unload the entire pallet one box at a time. Yay free money! Sofia was extra helpful during this process. I believe each box weighs about as much as she does. The flooring weighed about thirteen hundred pounds and took about ten minutes to carry inside. Now it is going to live in our dining room until we have a chance to move it to a slightly more hidden location. We aren't ready to install quite yet. This was today's favorite thing! Too many yellow paint colors, and none of them quite right! I know Tim wants me to stop wasting money on paint samples, but I can't find just the right yellow for our built in book shelves. And I still haven't decided on the white for the living room walls. I'm so fearful of making the wrong choice that I'm having trouble making any choices at all! In order to keep costs down as much as possible I'm making everything in Sofia's new bedroom myself. That last statement is only partly true. I actually enjoy making stuff and I get all warm and fuzzy feeling when people compliment the things I make. So, although I am cheap I am also a compliment hog. There, full disclosure! The first thing I am making for Sofi Sue is her rug. I can't get in the room yet to make her loft so I have to start small with things I can make and store until the guest bedroom/Tim's office furniture gets moved out. I first saw Laura from xoelle.com's tutorial a couple of years ago. The diy for this rug at xoelle.com made me start collecting old t-shirts immediately! I didn't know where I would put the rug I planned on making, I just knew that I had to have it! I started collecting white t-shirts at rummage sales and also got a few from my friend Sari. If you shop on the second day of a rummage sale they almost always have a bag sale to get rid of their extra inventory. For $5 you can fill up a bag with whatever you want, and I wanted t-shirts! After over a year of collecting t-shirts I finally had enough to make a good sized rug, as well as finally having an idea of which room to put the rug. In. Where on earth does the word in go in that sentence? Anyway, I also now knew that the rug would be pink to go with Sofi Sue's color scheme. But the latch hook method didn't end up working out for me. Instead I used This tutorial from thehappyhousewife.com . I already had the old towels so over the course of a several of months I cut my t-shirts, dyed them, and sewed them onto the towels. 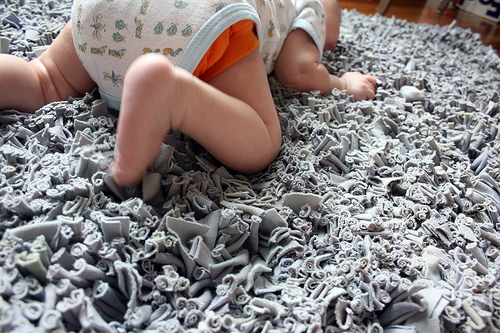 You have to scrunch the t-shirt strips up to make the rug fluffier. This rug is all about being fluffy! At this point sewing the rug was getting a little unwieldy. I only worked between a half an hour to an hour a day, otherwise this project wouldn't have taken me quite so long. I ran out of pink t-shirt strips partway through, but luckily found that I had stashed more white t-shirts under my craft table. After another run to Joann Fabrics I had enough pink dye to finish off the rug. And so at least a year and a half (I am underestimating here) after hatching a plan to make this rug it is finally done! This rug is a little under 4' by 4'. I was hoping for larger but didn't want to cut and dye any more t-shirts! Sofi had better use this rug until she moves out of the house! I can't believe I have turned into one of those people who spend long periods of time debating the merits of different shades of white. White is white, right? I am finding out that this is not true. 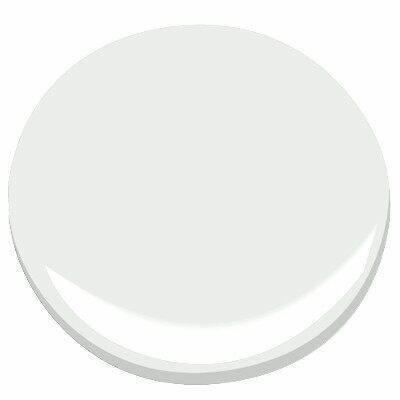 First I researched white paint colors online. Then I got a few sample pots and slapped them up on the walls in the living and dining rooms. I joked with the lady behind the paint counter at Home Depot that I would get home and not be able to tell the difference between the three whites I was wasting money on. But after putting them on the wall I was completely surprised to find that none of the colors even seemed terribly white to me! Simply White was a gorgeous white in the dining room but definitely a cream in the living room. Super White was a beautiful light grey that I would have considered back when I wanted a grey living room. And Decorators White comes across as having a definite color but I'm not sure what, maybe a violet grey or blue? Either way, I've ruled out Super White and would go with Decorator's white as being the most crisp and clean, which is what I want, except for how lovely Simply White looks in the dining room. If it looked that way in the living room as well the decision would already be made. I think I need a bigger swatch! Everybody loves surprises; surprise parties, surprise gifts, surprise sundaes (that last one isn't really a thing, but it should be). But surprises while doing a home renovation are not as much fun. I pulled the molding off from around the large door connecting my living and dining rooms in preparation for installing the bookshelves that are going to live there. Look at the wonderful surprise the last home owner left me! Evidently the door opening used to be an inch or so larger. I like large door openings, but I've already made the built in bookshelves that will go floor to ceiling as well as over the top of the door. I can't change the size of the door at this late stage so I will just have to fill the gap. The fun never ends with this house! I currently have 9 paint colors on the walls in my living room. And I have 10 colors on the wall in the dining room. I actually decided on the dining room color pretty quickly, but every time I come up with a new contender for the living room I have to put it up in the dining room as well to make sure that it doesn't clash. The two rooms have a large opening connecting them so I want to make sure that they go together well. This was not something that I ever bothered with in the old house, which is how I had bright yellow, red, chocolate brown, orange, mossy green, and dove grey all on the same level. I love color, but I think that for this new house I will try to be a little more grown up with my paint choices and not just splash the rainbow willy-nilly on the walls. I had originally decided on a light grey for the living room. 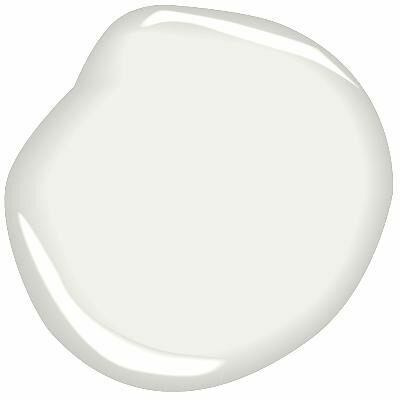 It took me months to decide on Sherwin Williams Eider White. But even after deciding that it was the grey that I liked the best I still felt uncertain in my choice. Finally, yesterday, I realized that the reason I was uneasy was that I had made the wrong choice! Funny how that works. I have already painted my ceiling in both the living and dining rooms a nice light blue. Putting a light grey on the wall sounds nice in theory, but in our old home our bedroom was light grey with a blue ceiling and I never did like how it looked. That ceiling was a lot darker, more of a turquoise, but it always felt very cold to me. I just didn't like the combination. I don't know why I thought I'd like it better here. If I hadn't painted the ceiling blue and had done a nice white instead, then the light grey would have looked awesome. But the ceiling is blue, and the built in will probably be yellow, so having a grey thrown into the mix seemed too much to me. I realized that what would look excellent would be white! Painting a room white would have been sacrilegious to me 5 to 10 years ago, but now it just seems like it would be so fresh and bright. I've already painted all of the basement white, mainly because I put in bright green foam floors and felt that I already had reached my color quota on the flooring. But I like it, and although I am not prepared to go white in every room of the house I do think it will look nice in this situation. Now, to decide which color white! Chickens poo. They poo a lot. I cannot stress enough how much poo chickens create. We've had our three lovely birds for just under a year and they've produced at least a ton of poo. (Statistics may be fabricated in the interest of making a point) Our chickens especially like to poo on our patio. Also, they know that we come in and out of our back door. And we are their main source of food. So the chickens like to congregate by our back door and do what chickens do best. There's nothing worse than stepping out of your back door into a small pile of chicken poo. Except for cold eggs. There's really nothing worse than cold eggs. Anyhoo. I needed to contain the poo, but felt guilty when I kept the chickens cooped up in their run. And the chickens objected, loudly, when they were kept in the run. So I decided to make a larger chicken yard that would keep the poo in and the rest of the yard safe to play and walk in. I didn't want this to be a big production, just a simple barrier to the chickens free ranging in our yard. I decided to go with metal t-posts and galvanized welded wire fencing. I also needed two wood posts to attach a gate to so that we could easily get in and out of the new and improved chicken run. As soon as it warmed up I started digging. Unfortunately, even though the air was warmer, the ground was still pretty frozen so I was able to dig a few inches each day and then had to wait until the next day for the sun to warm the ground enough to dig again. When the holes were finally 24 inches deep Tim held the posts level while I filled in with gravel and tamped it down. I decided to use a section of fencing that we had sitting in our garage to make the gate. I love using what we already have to save money and clear out some space! I had to buy a couple of extra fence pickets, cut the height of the fence down, and attach a little extra support. This wouldn't have happened without the help of my awesome neighbor Ken (I've mentioned him before as the savior of my basement painting scheme). Ken scoffed at the idea that I would use my sawzall to cut the bottom of the gate off. He pulled out his table saw and had the bottom cut in a nice straight line in no time. He even helped me to hang the gate. Thanks Ken! The chickens were intrigued by all of the digging and building. Luckily they are not intelligent enough to realize that they can fly over the fence anytime they want! I'm so happy to not have to yell "look out for the poop!" at my children every time they walk out the back door. I think the fence gives my yard a slightly farm like look that I really like. It's super cute for what is essentially a giant chicken toilet. Yay chicken toilet! Painting the laundry room took forever. Almost two months forever. Granted, most of that time was spent prepping, not painting. Our laundry room does not have a finished ceiling, so all of the pipes that go from the boiler to the radiators, the gas lines, the electrical conduit and the water lines are visible. I felt that we should avoid painting all of these. The pipes that go from the boiler to the radiators get super hot and would require special paint, and I kind of like the exposed pipe look. But in order to paint the unfinished ceiling with all of the nooks and crannies, the rough wood beams, and the hard to reach corners spraying the paint on was really our only option. That meant covering everything in the room that we didn't want to paint. I spent weeks wrapping all of the pipes in tin foil. By the end it looked as if I should be a wacky ufo enthusiast extra in an episode of the X-Files (how exciting is it that they've started that series up again?). I also covered up the windows and the doorways. My awesome neighbor Ken allowed me to borrow his sprayer and spent the morning with me to show me how to work it. Three gallons of paint later the room still wasn't completely white. The wood ceiling sucked up paint and the sprayer was acting up. I ended up buying a fourth gallon and using a roller and paint brush to finish up. That $100 dollars worth of paint payed off, the room is now much brighter and more inviting. Well, more inviting to humans. Spiders, on the other hand, are running scared! Brighter and much less scary!